You’re familiar with Decision Theory (or Game Theory) whether you know it or not. You may have seen the movie A Beautiful Mind, about John Nash, who was a pioneer in this field. Or, you’ve probably discussed in a class or retreat the most famous decision theory case: The Prisoner’s Dilemma. In the Prisoner’s Dilemma, you have two prisoners who have committed a crime together, but you don't have enough evidence to send them to jail for the term they deserve. The detective separates the prisoners and gives them options. If neither prisoner confesses, both will go to jail for one year. If you confess and your partner does not, you go free, and your partner goes to jail for ten years. If you do not confess and your partner does, your partner goes free, and you go to jail for ten years. If both of you confess, you both go to jail for five years. So, what does the prisoner do? It depends on how much you trust your accomplice. How Does Decision Theory Relate to Human Resources and Management? If this doesn't seem to relate to management or Human Resources (at least most of the time you’re not dealing with police investigations), in reality, these are the types of decisions you make every day. Think about year-end raises. You have a total of $3,000 to divide between two employees. Here are some of your options. Give the total amount to the star performer. Give 75 percent to the star, 25 percent to the other person. You can consider many ways to divide the money, but just like in the prisoner’s dilemma, you’ll experience the consequences of your decision. If you give all of the money to the better performing employee, you’ll probably keep that person happy, but you’ll damage the morale of the other employee. If you split the money, 50/50, the star will feel like she’s worked super hard for no reason, while the less productive employee will see no reason to improve. You have to strike a balance, and that’s where decision theory comes into play. The decisions you make should be logical—you should think through your options when you make choices. Sometimes you can use a decision tree to consider all of your options. Usually, these are yes/no options. You’ve probably seen funny decision making trees on the internet, but you can use them for a variety of practical decisions. They can help you sort through the what-ifs of any situation or decision. Are your employees customer-facing in their jobs? If yes, do the customers expect business dress? If no, do you have safety issues? You can work through the yesses, and no's to figure out what will work the best in your organization. If you determine that the employees are not customer facing and they have no safety issues, then open-toed shoes are appropriate for your dress code. If the employees are customer facing, but the customers don’t expect business dress, then you can go for a business casual dress code. You may say that you can make these decisions without a decision tree, and it’s highly likely that you can. 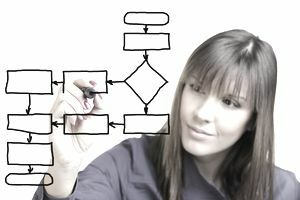 But, you'll be surprised how often companies don’t think through the yesses, and no's of a decision tree. It is how you end up with crazy policies that require IT people, who crawl on the floor to connect wires under desks, to wear suits. Or, you enable employees to wear open-toed shoes company-wide, rather than just in the office, when factory employees who work with products could easily break their toes. Figuring out the consequences of each decision an employee makes is often tricky, but in this example from the news, going through the decision tree would have helped. A Starbucks in Philadelphia made the news when the manager called police on two black men who were sitting in the cafe and had not ordered anything. Her decision tree should have looked like this. If yes, leave them alone. If no, have you spoken to them? If no, speak to them. If “we are meeting someone here,” then check back in 15 minutes. If “we are just hanging out,” remind them that they need to place an order. If the manager followed this same decision tree with every person who sat at a table—regardless of their race, you would have seen a different outcome. Going through these thought exercises can help remove any biases that you may have—conscious or unconscious, from the decision making. Decision theory has plenty of practical applications, and you can use it within HR and management to discover clear answers about what you should do in any given situation. Decision theory can help you explore the likely consequences of each action you take or decision you make. It is helpful for everyone—your employees, customers, managers, and other stakeholders.